Trump Organization Cuts Ties To Controversial SoHo Hotel : The Two-Way The part hotel, part condo building, from which the president had continued to profit as president, potentially linked him to murky financing arrangements and allegations of fraud. 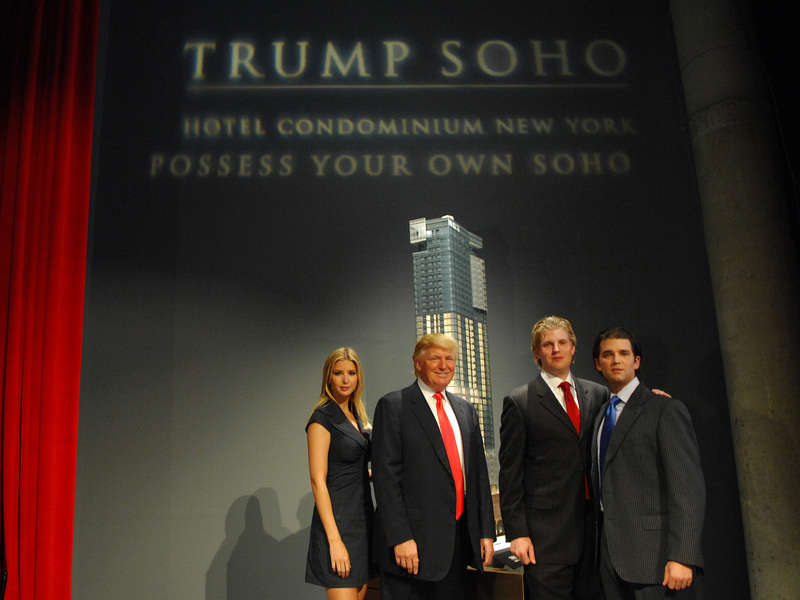 Ivanka Trump, Donald Trump, Eric Trump and Donald Trump Jr. stand before the rendering of the under-construction Trump SoHo Hotel Condominium in September 2007. 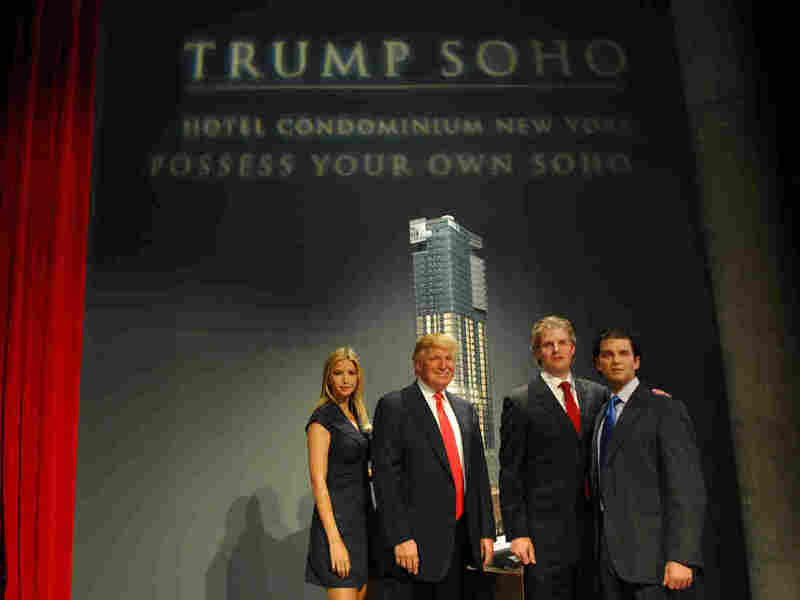 The Trump Organization is severing ties with the controversial Trump SoHo building in New York City. The development, which is a hybrid hotel-condominium building where owners of units can only live in their properties for a certain amount of time each year, has the potential to be a thorn in the side of President Trump — linking him to murky financing arrangements, allegations of fraud and a Russian-born developer with a criminal past. The skyscraper has been one of the Trump Organization's many business interests. When Trump was elected president last year, ethics experts urged him to sell off his private holdings to avoid distractions and conflicts of interest. Instead, Trump moved his businesses into a revocable trust, managed by his two older sons. Trump is the sole beneficiary of the trust. And the building's history — which NPR explored in a recent episode of the Embedded podcast — has repeatedly drawn controversy, including a lawsuit alleging fraud and shady financing. On Wednesday, Trump International Hotels Management and the board of the Trump SoHo Condominium New York said in a press release that they would wind down the Trump Organization's involvement by the end of the year. The announcement did not specify what led to this move. The unexpected end of the business relationship with the SoHo development comes as Trump's financial ties are reportedly being investigated by Department of Justice special counsel Robert Mueller in connection with a larger probe into Russian election interference last year and its possible links to Trump's 2016 presidential campaign. The Trumps do not own the hotel, but the Trump Organization has managed it and been paid for licensing the Trump name. Donald Trump had personally announced the project on a 2006 episode of his TV show The Apprentice and three of his children — Donald Jr., Ivanka and Eric — led its development. The hotel opened in 2010. As NPR has reported, the project made news from the very beginning: from the discovery of a burial vault on the construction site to a heated standoff with the neighborhood and a grisly death of a construction worker. One particularly sensitive matter involved one of the SoHo developers, called Bayrock, which has been accused of being a money-laundering operation used to conceal transfers of illicit funds from overseas, according to a lawsuit by Bayrock's former finance director. Bayrock has denied the allegations. The project was also sued by some of the early buyers of its condos, who said they were misled about many of the units were sold. Trump later settled the suit, returning nearly all of their down-payments.